Ian Southworth of Great Britain and his crew Andrew McLelland, Julia Scott, David Howlett and Chris McLaughlin kept their cool and sailed home an amazing start-to-finish win in the final race of the J/24 World Championship in Boltenhagen, Germany. American Mike Ingham, who was very close, finally had to let the prestigious trophy go to Southworth. As on Thursday, racing was started with a black flag after Principal Race Officer Klaus Lahme did a general recall. Southworth, who had already suffered a black flag disqualification the previous day, opted for a conservative start, as he couldn´t afford to let Ingham get away or–or even worse–let himself get pushed over the line. McLaughlin said, “Our worst fear was to have a black flag start again, but were relieved to get a good start and to find ourselves first at the windward mark through some very difficult shifts arriving.” Southworth and his team have been sailing Il Riccio for five years now. “It has been the longest quick campaign of our lives,” said McLaughlin. “We used to race the J/24 in the 80s and early 90s quite successfully, so in 2005 we thought we could just step on the boat and win the J/24 World Championship in Weymouth.” The crew finished eighth. Since then, they have constantly been working on speed, performance and sailing skills. “We have virtually rebuilt Il Riccio from the keel to the mast top,” continued McLaughlin. 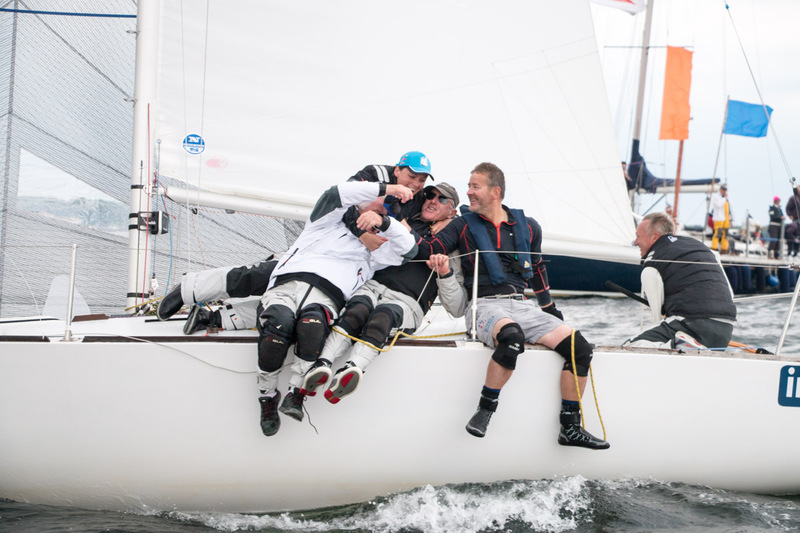 At some World Championships (like in Howth, Ireland and Cannigione, Italy), the crew was very close to the trophy, but narrowly lost in the end. “The thing we have learnt is that if you are not enjoying yourselves, you will never succeed,” said McLaughlin. “We have a team that is very close to each other, who has fun along the way, no matter if we win or lose. There were times in the middle of this week when I became very nervous and tense, and the rest of them laughed me out of it and made me have a glass of wine, and I felt a lot better the next day.” Tactician on Il Riccio is Howlett, who is the head coach of the German Olympic team. McLaughlin explained, “I have known David since I was 18 years old, and it has been fantastic to sail with a friend who is also such an incredible coach. David is a very special person, and also very demanding. We have not been drinking this week, we have not been partying, and we have eaten a lot of cake and tea in the afternoon because David has high standards. I think if the German Olympic team has the same experience as we have had, I think they should be winning some medals in Rio.” But, according to McLaughlin, the most important part of the team is bowwoman Julia Scott. Julia is a former 470 and Yngling Olympian. “Besides being a brilliant sailor, Julia makes sure that everyone is nice to each other. She is the boss! And she is incredibly tough. When we sailed the Worlds in Weymouth in 2010, Julia had just given birth to her first kid one week before. I think there haven´t been many J/24s that have measured in a breast pump at an international competition!” Ingham from Rochester, New York USA, who was sailing with the 2014 J/24 World Champion Will Welles as tactician, couldn´t cover Southworth in the last race and finished in eighth position. With 26 points difference, he and his crew placed second overall, with Travis Odenbach (also from Rochester, NY USA) in third. Competition was tight for the title of the best female crew. In the end, Stefanie Köpcke and her team Vega Ragazza won, closely followed by Ragna Thönnessen and team Juelssand, with just one point separating them. The best German boat was Team Tinto from Hamburg, helmed by Till Pomarius. Tinto, a mixed crew with an average age of less than 25, took the honors from older and more experienced crews, such as team Rotoman or Süllberg. “Our next goal is the Worlds 2016 in Japan,” said genoa trimmer Bele Schuett. This World Championship ended with a closing ceremony in the Marina of Boltenhagen. Fifty one teams competed from Argentina, Barbados, France, Great Britain, Germany, Greece, Hungary, Italy, Japan, Netherlands, Peru, Sweden and the USA. Complete regatta information and results may be found at http://www.j24worlds2015.com/Home/.